A Spalding man who received serious arm injuries when a bin lorry crashed into a ditch in Crowland on Wednesday morning has been released from hospital. Two colleagues who received minor injuries in the accident were treated and released on the same day. A man from Spalding was airlifted to hospital this morning, Wednesday, after a bin lorry crashed into a ditch. 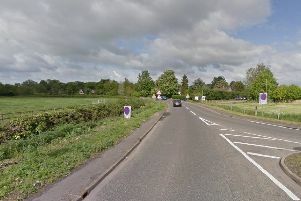 The incident happened in Nene Terrace Road, the B1040, near Crowland, at 10.25am. Medics from the air ambulance treated the casualty, who is in his 40s, at the scene for serious arm injuries before he was flown to Addenbrooke’s Hospital in Cambridge. Two colleagues received minor injuries. Road closures remain in place and drivers are asked to follow diversions. A spokesperson for South Holland District Council said: “Our immediate thoughts are with those involved and their families at this difficult time. “We can confirm there were three staff in the vehicle at the time of the incident. Two received minor injuries and one, who sustained serious injuries, was taken to Addenbrooke’s Hospital by air ambulance. We wish them all well and will support them where we can.